Barton Fiske will give a presentation about zSpace and how to take advantage of it’s lifelike immersive capabilities for a variety of potential applications. The company will then follow the presentation with individual demos so that the entire audience can experience the platform capabilities. zSpace is a revolutionary, immersive, interactive 3D environment for computing, creating, communication and entertainment. 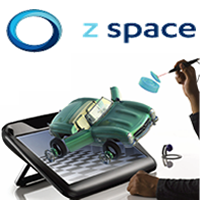 zSpace, Inc.®, formerly known as Infinite Z, is a leading-edge technology provider that enables natural interaction with virtual-holographic 3D imagery through it’s flagship product, zSpace®. Targeting markets including, manufacturing, architecture, engineering, government, medical and research, zSpace aims to accelerate design and development processes and increase productivity through 3D visualization. zSpace is a privately held, venture backed company located in Sunnyvale, CA, and has filed more than 30 patents for its innovative technologies.